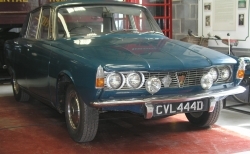 The Rover 2000 was considered to be an outstanding development in automotive engineering when it was first launched in 1964 and was a direct competitor to the Triumph 2000. It boasts 4-wheel power-assisted disc brakes, a De-Dion rear axle and bodywork of unitary construction but with detachable panels. This particular example carries a Lincoln registration and served two local owners for a total of 40 years before coming into the Society's care in late 2006. Oct 2007 - The P6 is now looking a lot smarter thanks to new member Dave, who has given the car a very good clean both inside and out. Pity it needs a lot of work to go back on the road. WANTED - a rear bumper for this car - please contact us if you can help!